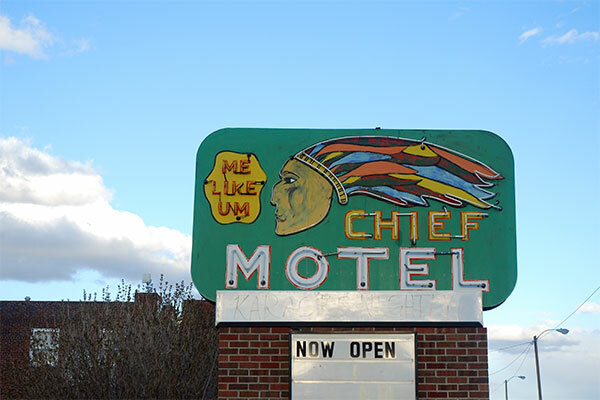 Speaking of old motel signs, here's one more ... this one is over in Whitehall. Definitely one of the more politically-oncorrect signs in the state, but I still quite like it. It's a reminder of an era. It's stylish and memorable...even though it is not PC. What is it about signs? Is it the design or the idea of what it conveys? I usually notice the lettering, good or bad. Yep, I'm a big fan of signs, too ... at least the ones that don't all look the same. :) They say a lot, about the people who made them, and the time in which they were made. And a lot of them are just cool-looking, besides! And no one's ever accused me of being PC in the least ... cleansing the world of supposedly derogatory references seems like a way of avoiding the real issues of the world, and just focusing on minor symptoms.